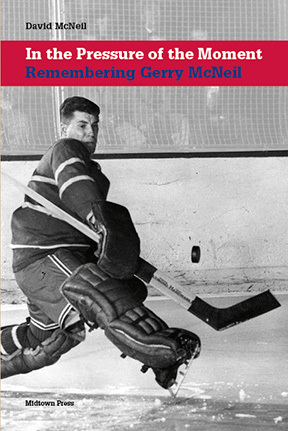 The story of Gerry McNeil’s short but remarkable NHL career underlines how our experience of the NHL has changed from the time of McNeil’s career to the modern spectacle of today. While McNeil’s NHL career was only four years, those years saw what might be called the golden age of sports photography (the 1940s and 1950s) and the beginning of Hockey Night in Canada on television. As readers follow McNeil’s journey from understudy to mainstay with the Habs, including four consecutive appearances in the Stanley Cup final, they also are reminded of how different the game was for fans and players alike. Imagine – only a radio broadcast, a newspaper story and a few professional photographs. Fans came to see Richard battle Howe. Fans saw the overtime Leaf goal by Barilko. Fans knew the name of every player because there were only six teams and trades were rare. In the Pressure of the Moment is a slice in time from the “original six” era when players travelled by train and fans wore suits and dresses.